FC Midtjylland striker Paul Onuachu is certain to make his international debut this month, according to Super Eagles coach Gernot Rohr, who was reacting to a question on why some players invited to the national team never get to play. The German football tactician made it crystal clear that he was satisfied with the performance of the leading scorer in the 2019 Africa Cup of Nations qualifiers, Odion Ighalo but he's excited that the lanky Onuachu will bring a new dimension to the Super Eagles attack. ''You know that we have possibility to see everybody because we have two games, even we have four games because the U23s are playing also. You will see a lot of players,'' Rohr said at a media parley attended by allnigeriasoccer.com. ''Paul Onuachu, he will play for at least 45 minutes or even more. We are searching for a player with his profile, tall, he is more than two meters tall. ''We have Ighalo already and we are very satisfied with what he's doing since the World Cup. 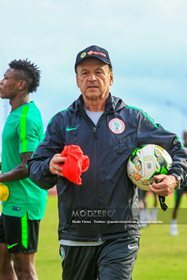 Gernot Rohr will begin observing the invited players when the Super Eagles hold their first training session in Asaba on Tuesday afternoon ahead of the Africa Cup of Nations qualifier against Seychelles.